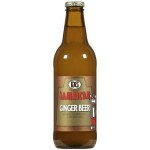 Genuine ginger flavored soda, with a crisp, spicy taste. Very similar to ginger ale, but more pungent and a bit more crisp. Serve very cold, or over ice.